Orchestra Music Collection: Complete National Anthems of the World by the Slovak State Philharmonic Orchestra, Kosice. If you are a fan of classical Orchestra music and the Olympic or Paralympic Games, there is one comprehensive collection of national anthems you may be interested in sampling. Comprised of 10 discs total, the official album title for this orchestral music collection, performed by a professional orchestra is; The Complete National Anthems of the World (2013 Edition). 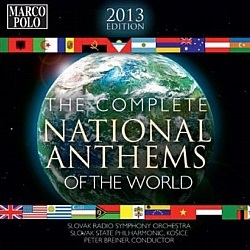 The Complete National Anthems of the World (2013 Edition) is an all-inclusive 10 disc collection with 462 songs performed by the Slovak State Philharmonic Orchestra, Kosice. While this collection of classical anthems is not the official orchestra performing during an actual Olympic or Paralympic Games Ceremony, the national anthems on this collection are authentic versions of national anthems for nearly every sovereign country in the world. Find the 462 song collection National Anthems of the World at Amazon.com.